Andrew Moore and Bonnie Gaunt have put together a magnificent confirmation of the 6,000 years of man on planet Earth, based on the dimensions of Earth, Sun and Moon. This cosmological clock reveals, with amazing accuracy, the pattern of events leading to the birth of Jesus Christ; and with the same accuracy the events regarding His return and Earth's Great Millennium. This cosmological clock ticks off the years and ages, and reveals an amazing pattern of time. Time and events in man's history and future are not random--they fit into a pattern with accuracy and precision. When Socrates spoke of “patterns in the heavens” he may not have known that the pattern pointed to September 11, 1999. In Genesis we were told that the Earth, Sun and Moon were to be for “signs, for seasons, for days and for years.” The cosmological clock, based on the dimensions of Earth, Sun and Moon, reveals those signs, seasons, days and years with magnificent precision. Chapters include: Is there a Purpose? ; Describing the Clock; What does it all Mean? ; The Perfect Square; The Equilateral Triangle, Sun-Earth-Moon; The Numbers on the Clock; The Amazing Inverted Triangle; The Cube and the Holy Place; Harmony of the Zodiac with Ancient Measures; The Egyptian Royal Foot; The Power of Feet; Three Sixes; Earth-Moon Measure 31,680; The Clock’s Amazing Gematria; The Amazing Number 343; The Great Pyramid; Six Thousand Years and Man’s Destiny; Ancient Mathematicians called Nine the Horizon; more. 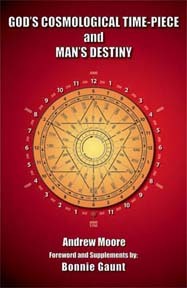 GOD’S COSMOLOGICAL TIME-PIECE AND MAN’S DESTINY By Andrew Moore and Bonnie Gaunt. 144 Pages. 5x9 Paperback. Illustrated. Bibliography.